Princess Eugenie and Jack Brooksbankare following in the footsteps of Meghan Markle and Prince Harryagain. The wedding gown that Eugenie, Harry's cousin, wore at her and Jack's October 2018 nuptials will be put on display at Windsor Castle by the Royal Collection Trust. The princess had worn a long sleeve, white, low back wedding dress by Peter Pilotto and Christopher De Vos. The gown was designed to show off the long scar she sustained from surgery she underwent at age 12 to correct scoliosis. "The fabric of the dress, also designed by Mr. Pilotto and Mr. De Vos, includes a number of symbols that are meaningful to Princess Eugenie," the Royal Collection Trust said in its announcement on Friday. "They include the White Rose of York and ivy, representing the couple's home, Ivy Cottage. The symbols were reinterpreted in a garland motif which was woven into a jacquard of silk, cotton and viscose blend using an intricate weaving technique." 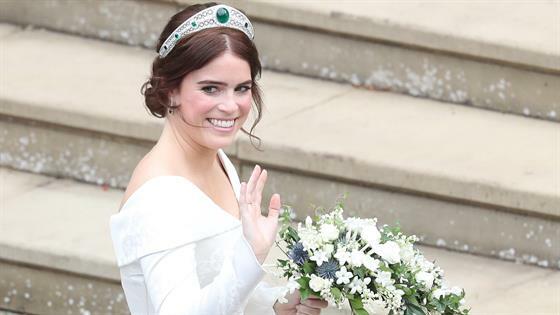 Eugenie's diamond and emerald drop earrings—a wedding gift from her husband, and the Greville Emerald Kokoshnik Tiara her grandmother Queen Elizabeth II had lent her will also be put on display, as will Jack's wedding outfit—a black and gray suit with a blue waistcoat. Last fall, Meghan's Givenchy wedding dress from her and Harry's May 2018 royal wedding was put on display at Windsor Castle, as was her long veil and diamond and platinum bandeau tiara that the queen lent her, Harry's frockcoat uniform of the Household Cavalry, and their niece and nephew Prince George and Princess Charlotte's page boy and bridesmaid outfits. Like the Duke and Duchess of Sussex, Eugenie and Jack had exchanged vows at St George's Chapel on the grounds of Windsor Castle. In 2011, the ivory and white satin Sarah Burton for Alexander McQueen wedding gown that Kate Middleton wore to her and Prince William's royal wedding went on display in Buckingham Palace, along with the Cartier "Halo" tiara she borrowed from the queen. The Duke and Duchess of Cambridge had wed in Westminster Abbey in London. The Royal Collection Trust's exhibition of Eugenie and Jack's wedding outfits will open at Windsor Castle on March 1 and close on April 22.